Acer Liquid Z3 is a dual sim smartphone for those on a budget that lacks premium specifications, but offers one interesting feature - pre-loaded user profiles. The entry-level smartphones sell really well in most areas of the world and the success of the Acer Liquid E1, E2, S1 and Z2 led to a new release of a such device, namely the Acer Liquid Z3. Powered by a 1 GHz dual-core processor and Android 4.2 Jelly Bean, the Liquid Z3 features a 3.5" display with a resolution of only 480 x 320 pixels, 512 MB of memory, 4 GB of internal storage and a 3 MP rear camera. With a weight of only 120 g, it measures just 109 x 60 x 10.4 mm. Additional features include a GPS module, Wi-Fi and the ability to connect to 21 Mbit/s HSPA+ networks. The four pre-loaded user profiles that make this smartphone really user friendly are called Basic, Senior, Classic and Keypad. The Basic one, for example, is aimed at youngsters, offering call and text functions. The Senior mode allows access to messages, radio, weather, clock, magnifier and the quick call function, making it much easier to use by the elders than a fully-featured smartphone. Available in Rock Black and Classic White, the Acer Liquid Z3 will hit Belgium, Netherlands, Ukraine, France, Spain, UK, Italy, Germany and Russia by the end of August. Priced at about $132 on these markets, the Liquid Z3 may arrive to the United States later this autumn, but we have no official confirmation yet. It would be a pity not to see it crossing the Atlantic, since it would be an interesting alternative to those who can't decide between the Sony Xperia E, Samsung Galaxy Fame and the HTC Desire 200! The Liquid Z3 features four pre-defined user profiles and a fast dual-core 1 GHz processor offering budget-cautious smartphone upgraders and first-time users between 7 – 70 years of age a fluid experience. In a small design powered by Android 4.2 Jelly Bean, Liquid Z3 gives you many features per square centimeter at just 109 x 60 x 10.4mm and only 120 grams. The Liquid Z3 touts a dual-core 1 GHz processor, a vivid 3.5-inch display, 4 gigabytes (GB) of internal user storage, Wi-Fi¹, integrated GPS, and a 3-megapixel camera. The optional dual SIM card slot gives users all the convenience of having two mobiles in one and easily manage personal and business communications combined with an HSPA+ (up to 21 Mbps) data connection that lets favorite apps react quickly and flow smoothly, while web pages and streaming media load very quickly. The Liquid Z3 features four different Quick Mode profiles targeted at different user and age groups. The Acer Liquid Z3 will be available in Belgium, Netherlands, Ukraine, France, Spain, UK, Italy, Germany and Russia starting from mid-August at a suggested price of €99. 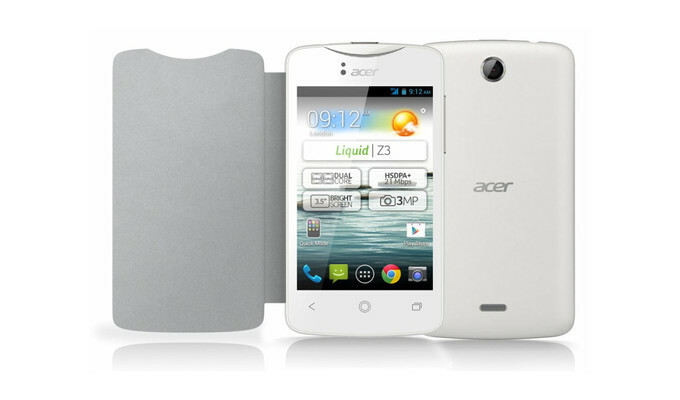 The Acer Liquid Z3 will be available in two colours: Rock Black and Classic White. A range of accessories will be available including flip-covers and replaceable back-covers in Rock Black, Classic White, Sakura Pink, Pop Yellow and Lagoon Turquoise, along with the more standard screen protection film.